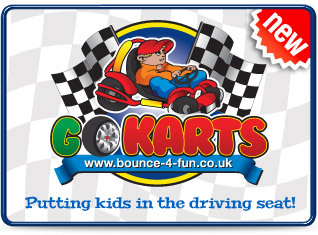 Bounce4Fun Basingstoke | Bouncy castle hire, go-karts, sumo suits, inflatable slides, rodeo bulls, total wipeout, zorb balling, giant games, soft play, bungee runs and more! Welcome to Bounce4Fun, Basingstoke's premier Event & Party Hire company that guarantees to put that extra "Bounce" into your party/event! 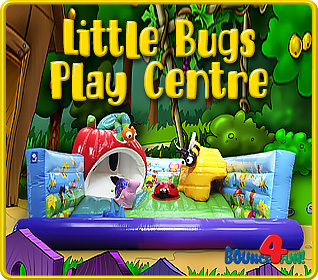 Bounce4Fun is a family run business with over 10 years experience in the inflatable world. We thrive on customer satisfaction and will always go above and beyond to offer you a friendly professional and trustworthy service. We have an extensive range of inflatables to cater for occasions all year round... birthdays, corporate events, fun days, fetes weddings, festivals, Xmas events and many more. Our inflatables offer everything you need and will guarantee to keep the children (and big kids!) entertained with our ever expanding range of bouncy castles, inflatable slides, go karts, snow globe, rodeo bull, surf simulator, zorb balling, total wipeout, assault courses, soft play, giant games and so much more! We even take the hassle out of your party/event as we deliver, setup and take away your chosen inflatable leaving you to enjoy your day and have fun - we are nice like that! We pride ourselves on our safety, our entire inflatable range is covered by public liability insurance. All inflatable equipment is independently tested annually and has a current PIPA or RPII safety certificate so please book with confidence! Alternatively check availability and book directly online. "I can very highly recommend this company, they provide a great service. I had to change my order a couple of times and heard back from them happy to accommodate within 24 hours, great contact with confirming order, I had every confidence everything would turn up which it did and perfectly timed. Will definitely be using again."